The 2828-E is an industrial workhorse for serious underwater cleaning. Generating a super stream of high velocity cavitation bubbles for highly efficient cleaning which can strip fouling, corrosion and coatings to bare metal if desired. Also rated for off-shore use. This unit comes equipped with a 60hp, multi-voltage, 3-phase electric motor with a 1 year manufacturer's warranty and a Udor VX series triplex plunger pump with a 5 year manufacturer's warranty. The heavy duty powder coated steel frame comes with lifting eyes and forklift slots. Effective on all industrial applications industry wide. 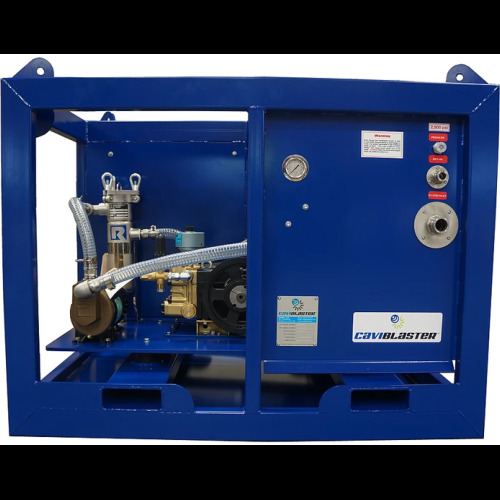 Standard accessories include zero-thrust balanced gun, electric centrifical self priming pump, 15' of by-pass hose and 50' of 3/4" nuetrally bouyant high pressure thermoplastic hose. Unit designed to be utilized as a zero-thrust 2 gun system. All electric units come in a 50hz or 60hz option.